The Jumpsuit Is Still Robust And Stylish! Back several years ago, jumpsuits made a surge in the fashion world. You’ve seen me wearing them since I started Chic Over 50. I LOVE them! They absolutely are still fashionable and stylish!! This denim jumpsuit makes me feel like Wonder Woman!!! Like a LADY BOSS maybe??? I’ll post a picture from the front next week as I’ll be talking about all things denim! I think I’ve blogged about this before, but one of my favorite jumpsuits I ever had was one I wore when all of my boys were little. It was white with all kinds of patches and emblems on it….sort of like an astronaut suit! Sounds terrible I guess, but it was SO DANG CUTE! I would wear it today if I still had it. This picture of me and my boys was taken probably back in about 1988. I was living in Colorado…it’s such a treasure!!! I LOVED being a mom and caring for these three little boys of mine. This picture has been at my son’s house and I’ve missed it! Do you notice what I’m wearing??? Denim overalls, sort of jumpsuit-like? And I loved this look even when I was a teenager!!!! I still remember a jumpsuit I wore waaaaaay back then! Me and My Three Sons! Fashion is funny how it just keeps circulating, but with just enough of a twist to keep you intrigued and wanting the latest version of a particular style. I still haven’t gone for overalls these last couple of years, and vowed I NEVER would wear that look at my age. But I’ve seen some really cute ones, and probably should NEVER say NEVER! You may just see me in them soon! I’ve linked some really cute denim jumpsuits here. 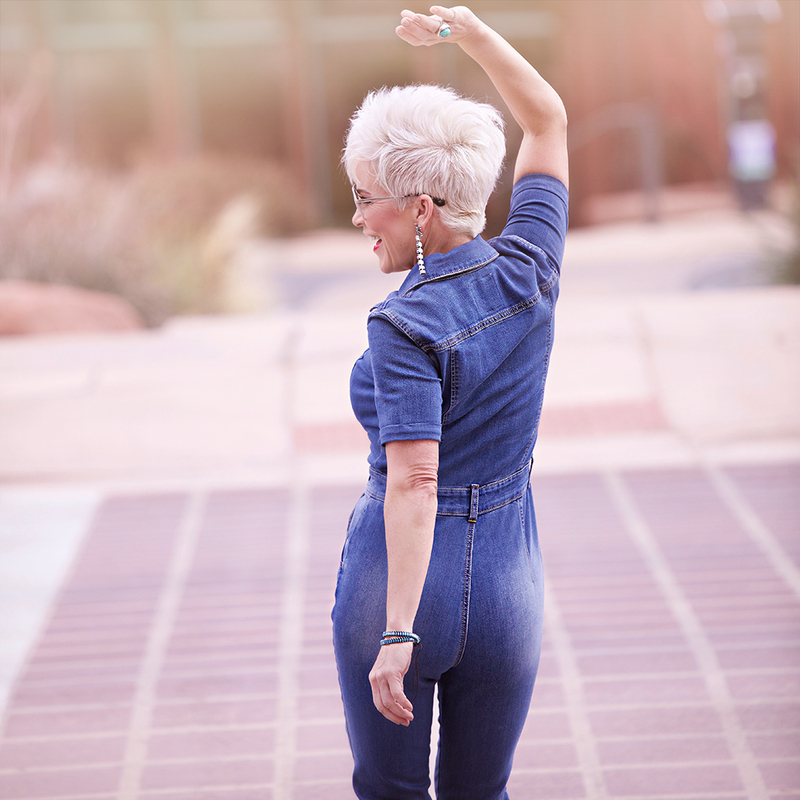 If I were to invest in my first jumpsuit….it would be denim. I can dress this one up or down just with accessories or jackets. By the way, the jumpsuit I’m wearing is sold-out. I think denim is much more versatile than one made from any other fabric. Could you wear it in an office? I think depending on your office, I would say ABSOLUTELY! Pair it with some conservative pumps and earrings, maybe with some pearls and a structured bag, for a great look! I remember that jumpsuit as well, and that was the first time I experienced FASHION ENVY! Ha!!!! Yes….I think I know what you mean Cheryl!!!!! LOL!